I used the materials when they were popular in the 90s. They may have been updated since then, so my review will be based on the original. I only used the book. I did not observe the video. I don’t attend Willow Creek, nor go to a seeker sensitive type church. The course can serve as a foundation for an evangelism group — where group members meet to discuss and debrief their spiritual conversations, and hold each other accountable to making connections outside the church. Is there value in this course? I think there is value in anything that will help fan the fires of evangelism in a local church. If you are a fan of the urgent confrontational style of evangelism, a la Way of the Master, then this material will bother you because of its emphasis on building relationships and earning the right to be heard. My suggestion is to read Becoming a Contagious Christian yourself (it’s a read that can be done in a few hours, particularly if you have read many other evangelism books) and see if it fits the style of your congregation. If 10 people started bringing 2 unchurched people to your church as part of that relationship building, how would your church react to 20 new people? Order your copy of Becoming a Contagious Christian, Hybels and Mittleberg from Amazon today. 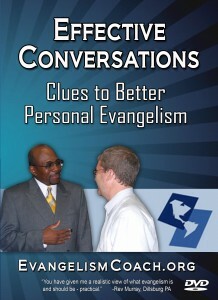 What books on Personal Evangelism have you read? (Here is my list of favorite evangelism books). I invite you to post your comments on this book, or any other here.